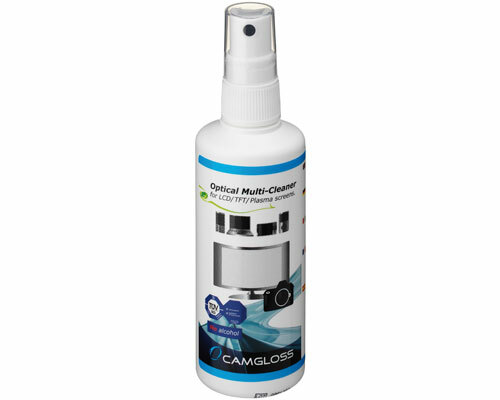 Camgloss Optical Multi Cleaner was especially designed for cleaning LCD, TFT or plasma displays of your multimedia devices such as TV, digital camera, laptop, etc. and other highly sensitive surfaces like lenses, filters, binoculars and glasses. Simply spray the fluid onto the Camgloss microfibre cleaning cloth and clean the surface streakless. Dust and dirt are immediately removed with a antistatic result. The fluid is biodegradable and contains no alcohol!